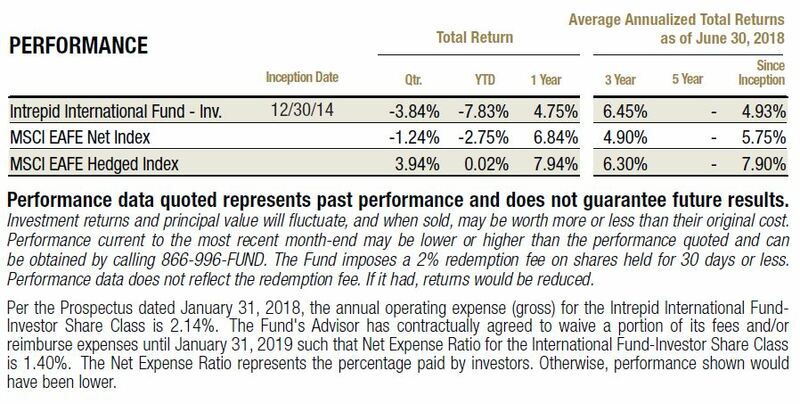 The Intrepid International Fund (the “Fund”) declined 3.84% during the quarter, compared to the MSCI EAFE Index’s (the “Index”) decline of 1.24%. This is the second consecutive quarter the Index has outperformed the Fund, and in a down market. This may sound like the opposite of what we have told investors to expect, but we believe we have been consistent in our message. Two quarters is a short time period. If the Index were to continue to be in negative territory for a long period of time, we would expect to outperform. The same is true on the other side. In the last two quarters of 2017, the Fund outperformed the Index in a rising market. In our fourth quarter commentary we stated, “Putting the record on repeat, we do not expect to outperform in a strong upward market.” We are saying now that we do not expect underperformance on the downside to continue. However, our relatively concentrated portfolio can cause some short-term swings by individual securities. This was the case in the first quarter of this year, as well as the second. To better understand our performance, it’s important to address the performance of our individual securities. 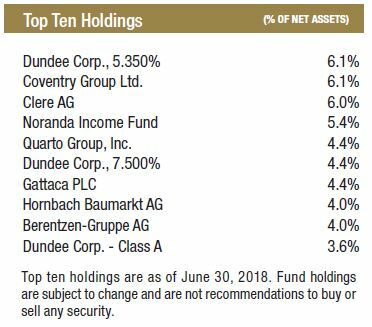 The top three contributors for the Fund in the second quarter were Coventry Group (ticker: CYG AU), GUD Holdings (ticker: GUD AU), and Mediagrif Interactive (MDF CN). The top three detractors during the period were Gattaca (ticker: GATC LN), Quarto Group (ticker: QRT LN), and KSB SE & CO. (ticker: KSB GR). There was nothing especially noteworthy about the contributors, so we will spare our investors the time and effort of reading about those. Despite our efforts to hedge, we typically report our contributors and detractors based on their performance in dollars (i.e. unhedged). This is not precise, but when currency volatility is low it gives a good approximation. During the second quarter of 2018, the dollar strengthened, causing individual security performance in dollars to appear lower than in local currency or with hedges included. For this reason, we reviewed our performance in local currency as well (i.e. assuming the stock price is hedged to US dollars). Regardless of the weak currencies, the order of contributors and detractors was similar except for one: Dundee Corp (ticker: DC/A CN). For this reason, we will comment on Dundee as well. Gattaca is a specialized recruitment firm in the UK focused on engineering and technology. Historically, the company has been accompanied by a growth story backing a hefty valuation, having doubled revenue over the six years ending fiscal 2017. However, a large acquisition made in 2015 now appears to have been a mistake. The acquired company, Networkers, is having issues with their Telecom customers, which has dampened revenue growth and profitability for Gattaca. These customers now make up a smaller part of the business, and management has made some changes that we believe will have a positive impact. Despite this, the enterprise trades at a cheap value of less than 4.5x EBIT, less than half of their respective peer group. The company is not falling apart; in fact, they grew revenue in the most recent period. Many of the previous owners of the stock held it for the growth potential. As they have sold out, there has been tremendous pressure on the stock. This has given us the opportunity to purchase at what we think is a discount to our calculated intrinsic value. Quarto Group is a UK illustrated book publisher that sells its products around the world. Toward the end of 2016, the company sold a large quantity of books into the retail channel–more than the retailers needed. When the company reported 2017 results, there were significant costs associated with retailers returning these books. This negative development sent the shares tumbling. We believe that earnings were overstated in 2016 but were probably understated in 2017 and will likely revert to normal levels throughout 2018. Adding insult to injury, the company’s founder, who was kicked off the Board in 2012, fought his way back onto the Board, causing the CEO in place at the time to step down. This may look like mayhem, but we believe the founder has shareholder interests in mind. In fact, we think he’s too aggressive with shareholder friendly acts, especially in the case of desiring a dividend reinstatement despite a large debt balance. We don’t think the banks will allow him to reinstate the dividend and believe debt repayment over the next couple of years will cause the value of the equity to improve substantially. KSB SE is a German pump company we have owned for several years, albeit at different weights of the portfolio. Coming off strong results in 2017, the outlook for 2018 was rosy. We took this time to reduce our position in the portfolio. In early May of this year, the company announced that a former project in Great Britain will cause earnings to decline about €25 million this year, meaning they will not hit their forecast for growth. Since making the announcement, the stock has been trading lower. The project, assigned to KSB in 2010, relates to underground pumps in London that remove excess water when rainfall is heavy. A recent analysis suggested that KSB needs to exchange these pumps. We believe this is a one-off event. This is what we consider a normal risk in investing in businesses. These things happen, and when they do we don’t believe our analysis is wrong. In fact, we expect events like this to happen from time to time. We still believe the business fundamentals are strong and continue to hold on to the investment. Dundee Corp continues to be a detractor for the portfolio. Despite having net assets on the balance sheet worth substantially more than the value the shares trade for, the stock continues to suffer. We now believe much of this is warranted, as management has disappointed time and time again. The business continues to burn cash and has been a steady detractor to our portfolio. We are currently evaluating the position. There were no new securities added to the Fund in the second quarter, but we exited four securities. Three of these were companies that were acquired: LifeHealthcare Group (ticker: LHC AU), Primero Mining’s 5.75% Convertible Notes (CUSIP: 74164WAB2), and ToxFree (ticker: TOX AU). We have discussed all three in previous commentaries and were simply waiting for the deals to close. The fourth security – Retail Food Group (ticker: RFG AU) – is a little more complicated, as we concluded this investment was a mistake. Retail Food Group is an Australian restaurant franchisor. We have experience with domestic franchise businesses, which tend to be stable operations with fat, boring cash flow streams. We felt our understanding here could be parlayed into adding value with an Australian franchisee. We were wrong. We purchased the stock as the price was falling precipitously in the fourth quarter of 2017 amid negative media reports. We determined some of these allegations were false, and we discovered similar articles about other companies written by the same author that ultimately did not create any significant long-term decline in business value. To us, it looked like a Boy-who-cried-wolf situation featuring a deeply discounted business. We were reassured when the company’s management told us its franchisee base was largely healthy and as profitable as they had been in prior years. As things got worse, we determined further research was required and decided to put boots on the ground. Two of our brightest analysts, Matt Parker and Hunter Hayes, traveled Down Under and interviewed franchisees, a lobbyist, former employees, and management. Their findings were disheartening, to say the least. It was clear franchisees were struggling more than we expected. And even more concerning, the company’s management appeared clueless to their plight, as nearly all franchisees interviewed mentioned they were forced to purchase supplies at inflated prices (negating the purchasing power benefit of joining a franchise system). After a meeting with the management team, we were not convinced there was a sound plan in place to put the business back on track. Our mistakes here include not initially investigating further, believing franchise businesses tend to be stable, and assuming franchise disclosure requirements in Australia are on par with or close to American standards, when in reality the company was able to dodge and stonewall our requests for documents that in the U.S. are easily accessible. We believe investing in the Fund gives clients access to unique, uncorrelated securities that should provide attractive risk-adjusted returns over time. Historically, we have focused our commentaries on some of the unique securities we’re invested in. Here, we will explain the lack of correlation the Fund has with the overall market. Many investors allocate capital to international portfolios with the hope of being more diversified and adding exposure to something uncorrelated with the domestic markets. We believe investors are overstating the positive impacts most index-tracking international products add to their overall portfolio. Since ICMIX has not been around for 20 years, we cannot perform the same long-term analysis. 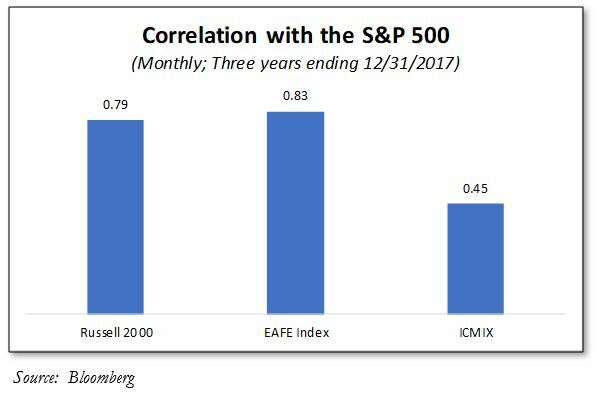 However, over the three years ending December 31, 2017, we see that the EAFE again has a higher correlation with the S&P 500 than the Russell 2000. The Fund, on the other hand, is not even close – despite investing primarily in the same developed markets as the Index, its correlation with domestic large cap stocks is roughly half that of the EAFE! For those unfamiliar with correlation coefficients, fear not. CFA level 1 reading material lays it out in succinct fashion: “As the correlation falls, the risk becomes smaller and smaller.” To simplify further, most investors try to find uncorrelated assets to increase the benefits of diversification. We argue that investing in many of the traditional international asset options does not help investors achieve these diversification benefits. In fact, the diversification benefits were worse than investing in domestic small cap stocks. We believe part of the beauty of the Fund and its intentional construction lies in its superior diversification benefits relative to the Index, as well as most other international funds. International active managers tend to buy the same stocks that are in the index. By contrast, only one of the stocks held in the Fund is a member of the Index. For this reason, the Fund’s performance tends to be independent of the factors many macro investors are focusing on. For example, if international equities continue to underperform and assets begin to flow out of ETFs tracking the EAFE or ACWI indexes, causing pressure on their constituent stocks, the Fund should not suffer the same fate. We believe another fear investors have when investing in international small cap companies is that risk is much higher. We think it can be, but it does not have to be. Standard deviation is the measure that most investors use to define risk. 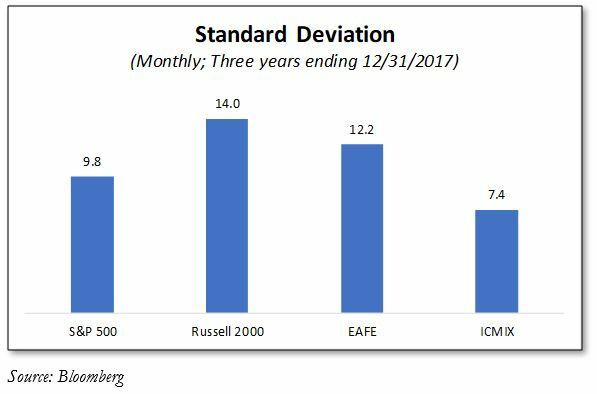 For the three years ending December 31, 2017, the Fund has had a lower standard deviation than the Index or the Russell 2000 Index. In fact, volatility has even been lower than the S&P 500. We attribute this to higher cash levels, as well as security selection. Many of the companies we have invested in have what we believe to be defensible business models. Additionally, we focus on companies with little leverage that sell to stable end markets. We are proud that our research discipline shows up in the portfolio numbers. Through the first six months of 2018, our performance has not been what we desire. However, we believe the portfolio is well positioned to profit from individual positions, as well as being protected from a large market selloff. Part of this comes from a large cash balance of over 20%. As always, we’re more than happy to discuss the portfolio with current and potential investors. Feel free to call, write or email us. CFA Institute. CFA Program Curriculum 2015 Level 1. Vol. 4., pp. 308-309. Mutual fund investing involves risk. Principal loss is possible. The Fund is subject to special risks including volatility due to investments in smaller companies, which involve additional risks such as limited liquidity and greater volatility. The Fund may invest in foreign securities which involve greater volatility and political, economic and currency risks and differences in accounting methods. The risks of owning ETFs generally reflect the risks of owning the underlying securities they are designed to track. ETFs also have management fees that increase their costs versus the costs of owning the underlying securities directly. The MSCI EAFE Net Index is recognized as the pre-eminent benchmark in the United States to measure international equity performance. The MSCI EAFE Hedged Index represents a close estimation of the performance that can be achieved by hedging the currency exposures of its parent index, the MSCI EAFE Index, to the USD, the "home" currency for the hedged index. The index is 100% hedged to the USD by selling each foreign currency forward at the one-month Forward weight. The S&P 500 Index is a broad based, unmanaged index of 500 stocks, which is widely recognized as representative of the U.S. equity market in general. The Russell 2000 Index consists of the smallest 2,000 companies in a group of 3,000 U.S. companies in the Russell 3000 Index, as ranked by market capitalization. You cannot invest directly in an index. Yield is the income return on an investment. It refers to the interest or dividends received from a security and is usually expressed annually as a percentage based on the investment’s cost, its current market value or its face value. Dividend Yield is calculated by dividing the dollar value of dividends paid in a given year per share of stock held by the dollar value of one share of stock. Free Cash Flow Yield is calculated by taking the free cash flow per share dividend by the share price. Free Cash Flow measures the cash generating capability of a company by subtracting capital expenditures from cash flow from operations. EBIT refers to Earnings before Interest and Taxes. Correlation is the extent to which the values of different types of investments move in tandem with one another in response to changing economic and market conditions. Standard Deviation is a statistical measure of portfolio risk used to measure variability of total return around an average, over a specified time. The greater the standard deviation over the period, the wider the variability or range of returns and hence, the greater the fund’s volatility. As of 6/30/18, 1 USD = 0.8554 EUR.